Following the end of WWII the UK’s air defence system was largely placed into a care and maintenance mode and was a long way from being fully operational. The Berlin blockade of 1948 and the increasing threat posed by Russian long range bombers provoked a rethink and frantic efforts were make to improve the countries air defences. 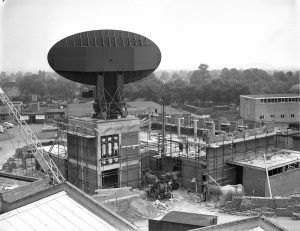 Initially industry were instructed to improve the war time Chain Home and GCI radar networks and partly automate the (essentially manual) control and reporting system which had served the country well during the Battle of Britain. The specification called for a Meteor aircraft to be tracked at a range of 150 miles. No new radars developments were planned. However in 1953, under the code name Green Garlic and using the antenna and turning gear from two wartime radars with a new klytstron transmitter, TRE produced a long range surveillance radar which easily met the range requirement. This was quickly developed to full prototype stage and became known as the Type 80 radar. This new radar was sufficiently capable, when paired with a couple of height finding radars, to be able to perform both the surveillance and tracking roles required by the control and reporting system. This led to the vast majority of the WWII radars being retired and replaced by a new network of Type 80 radars. However doubts remained about Type 80s susceptibility to jamming and in 1956, a number of brute force, that is very high power solutions were tried. The first, Blue Ribband radar proved too expensive and the project was cancelled. Another new radar was proposed, Blue Yeoman, which was once again to be built using parts from previous projects. The recently upgraded antenna and turning gear from the Type 82 (Orange Yeoman) radar at North Site (Malvern Vale) was selected and hurredly transported to South Site. 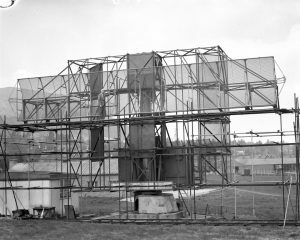 Fortunately a suitable building was already under construction – to house the prototype Blue Ribband radar. This quickly became known as BY building. 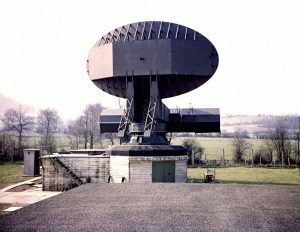 The Malvern radar only had 4 transmitters and receivers; the operational Type 85 radars, when eventually built, contained the full set of 12. Their antennas were 50% bigger than the Malvern prototype. The transmitter valves were huge; they were 6ft tall, weighed about a ton and had to live in lead lined cabinets to contain the X rays that were produced. Following the successful introduction of the Type 85 radar into operational service the need for the Malvern Blue Yeoman declined. All the original transmitters and receivers were stripped out in the early 1980s and replaced by two second hand (from the Dutch? navy) Plessey Naval AWS-5 transmitters. Various experimental receivers were introduced and the system was renamed ‘Byson’. 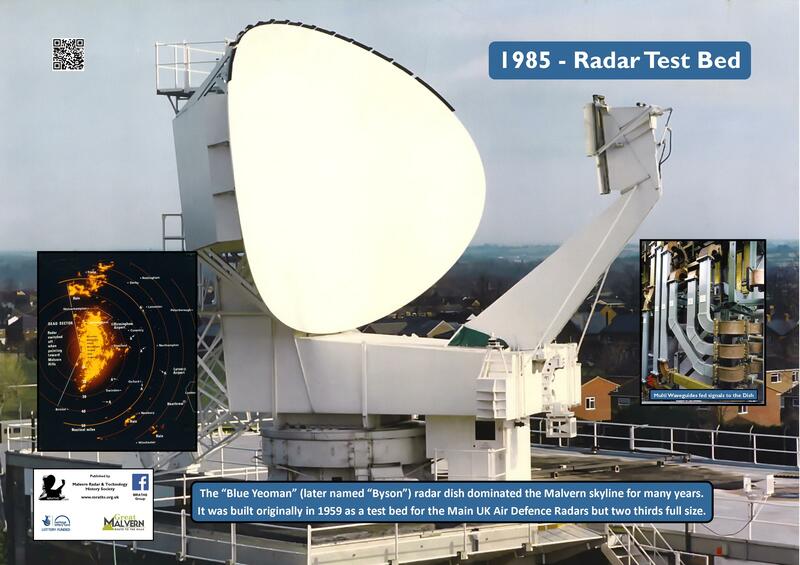 RSRE aggressively marketed the radar as being available for research purposes. In the late 1990s it was proposed that all radar research activities should be carried out from the Chilbolton observatory in Hampshire which was operated by the Rutherford & Appleton Laboratory. As no one has a spare transmitter lying around at the time the decision was taken to use the ones from Byson and they were duly removed. Unfortunately frequency clearance could not be obtained at the new site and the project was abandoned with inevitable consequences. The Byson radar antenna and turning gear were dismantled on the 27th July 2000. An attempt was made to give them to a museum but the cost turned out to be prohibitive. The transmitters were similarly disposed of.